Ben FM’s Totally Tubular 80’s Party! 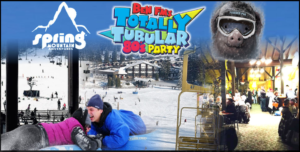 Join BEN at Spring Mountain on Saturday, January 27th from 4pm-7pm for BEN’s Totally Tubular 80’s Party. Enjoy great food and drinks in the Powder Pig Pub, games, prizes, and The Benjamin’s – an awesome 80’s cover band – will grace the stage playing your 80’s favorites! Tubing runs from either 1pm-4:30pm or 5pm-8:30pm. Purchase tubing tickets in advance by clicking “book online” on our home page – tubing can sell out! The Ben FM crew will be in the Powder Pig Pub from 4-7 PM – no tickets necessary to join the fun – just purchase food and drinks when you get there! OPENING DAY FOR 2017/18 WINTER SEASON! !